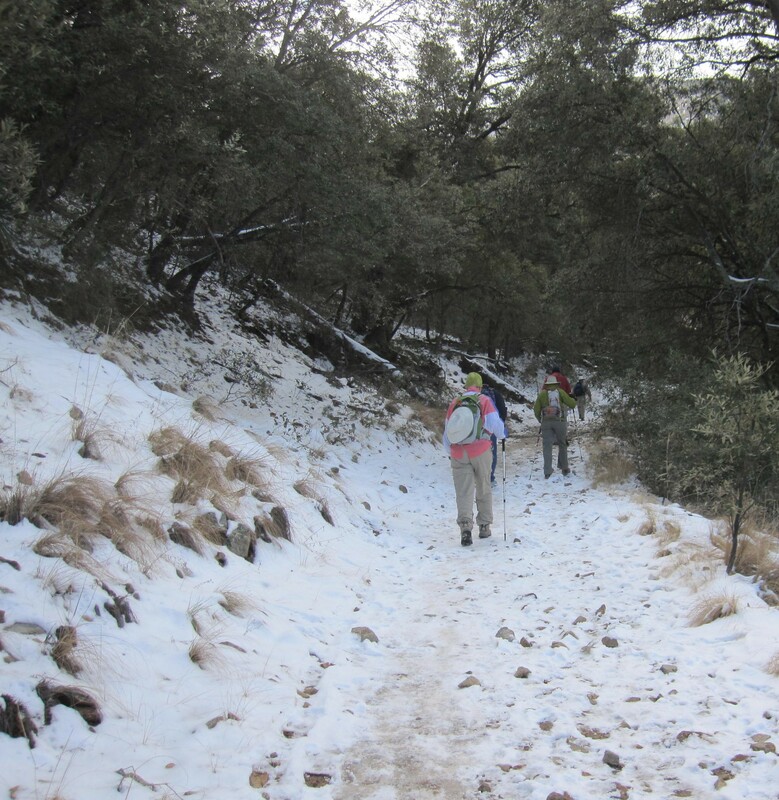 So…..cold and wintry here in AZ, but we are determined to hike today. Rick and Linda from Grand Rapids (MI) are here, and they’re looking forward to their first hiking in AZ elevations. We’ve decided to go up to Madera Canyon, and take the Old Baldy Trail to Josephine Saddle and return on the Vault Mine Trail. However, a steep slippery climb at the onset changed our minds. It was very difficult to get any kind of secure footing due to the snow and icy footprints that had preceded us. So, we backtracked to the Carrie Nation Trail, which had much more snow, but fewer travelers before us. It was not packed down, and much easier to navigate. Part of the fun is crossing water. The stream was flowing a bit so crossing each time was tricky. After about 3/4 mile, we came to a dead end – either we were slightly off the trail, or it just wasn’t plainly visible because of the snow. 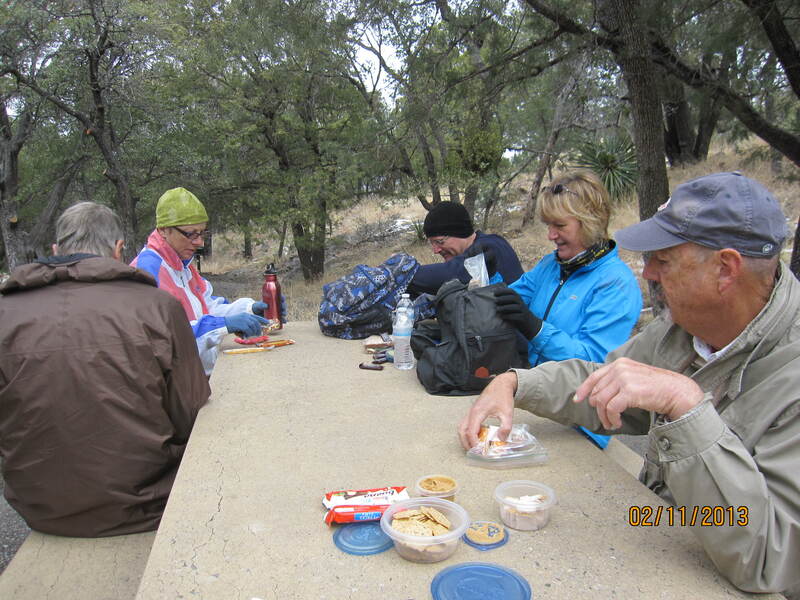 So, we backtracked and ‘enjoyed’ our lunch on a cement picnic table in 36 degree temps. If you bring lunch, you gotta eat it on the trail. Until the wind picked up, it actually was pretty pleasant. 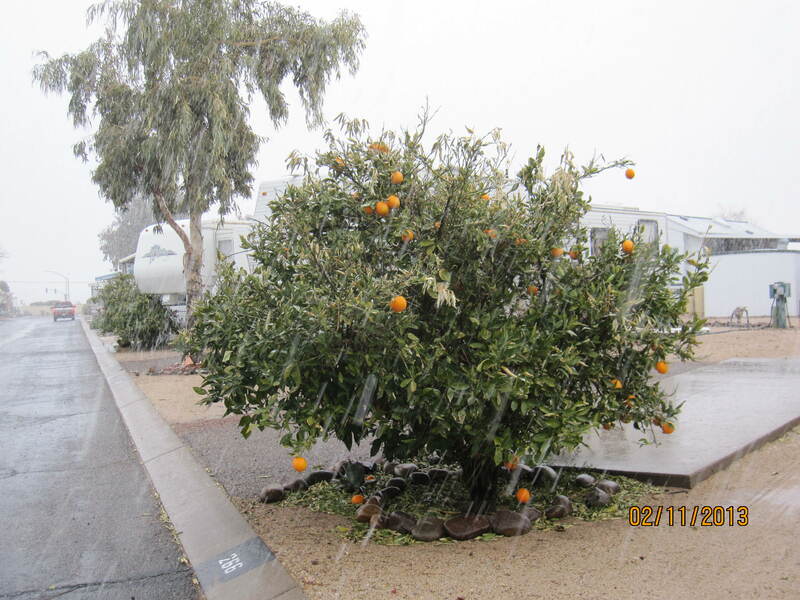 But then came the snow…..
We’re actually feeling pretty sorry for our friends who spent real money to come here this week to bike & enjoy the warm Arizona sunshine. It exists only in the stories we tell them. That leaves a lot of frustration all around – the Blakes are eager to dish out the hurt on bikes, and John is eager to make everyone climb mountains. We just all need the snow to go, and the sun to come. More snow in Green Valley. Weather is just awful. We’ll see what tomorrow brings….. This entry was posted in hiking, RV life, Uncategorized and tagged Arizona, hiking, retirement by Judy Crankshaw. Bookmark the permalink. Bad weather is all relative. Being from Michigan, this is waaaay better than what we would have at home, even if it’s less than what we hope for in Arizona. how much ice did you get?? Whoa! Was that an orange tree at the end? Hope you get some warm temps while Rick and Linda are there. But it still looks beautiful. Hi to everybody. Our neighbors have an orange tree – that’s it. Today’s high is 52. Tomorrow, 62, then 66, 68….we’re heading in the right direction. If the sun would just shine a bit, it would take care of all the problems! Well if the weather is so gosh darn awful in Arizona, why don’t you head on back to Michigan and enjoy some of what we have here? Last time I looked, I didn’t see any oranges hanging on our trees! Enjoy it my friend. You can’t tell from the photo, but these oranges are probably frozen solid. We’re hoping for a brief warmup today, so that we don’t freeze our butts off on the bikes.